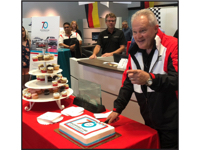 Peacock Automotive brought together sports car lovers, local dignitaries and others from across Coastal Georgia and the South Carolina Lowcountry to celebrate the seventieth anniversary of Porsche’s line of premium automobiles. Guests were invited to celebrate “Sportscar Together Day” at Porsche of Hilton Head in the Peacock Auto Mall on Highway 278 in Hardeeville, S.C.
Amy Graybill is the new finance manager at Hilton Head Public Service District. She will be transitioning with Larry Sapp, who is retiring in January 2019. 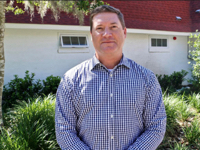 Graybill is a certified public accountant and a Hilton Head resident. 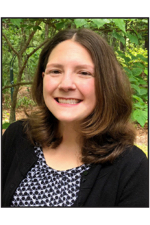 She has worked for the CPA firm Robinson Grant & Co. on Hilton Head for 10 years and has extensive knowledge and experience in governmental accounting. 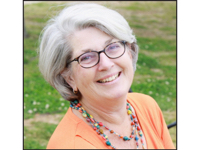 Local resident and author Elizabeth Robin is pleased to announce the recent release of her second book of original poetry. Where Green Meets Blue honors her late husband, who loved the Lowcountry landscapes. Her first book, Silk Purses and Lemonade was released in 2017 and remains in the top 20 of over 2800 titles offered at Finishing Line Press. For more information, visit elizabethrobin.com. 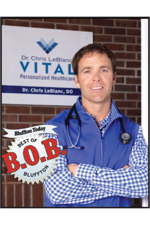 Dr. Chris LeBlanc of Vital Personalized Healthcare has won Best General Practice Physician in the recent Best of Bluffton contest. It’s his first nomination and first win. To schedule a meet and greet with Dr. LeBlanc, please call (843) 815-5566. 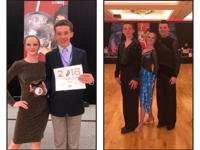 Emily and Teddy Oldham along with instructor Sandro Virag from the Fred Astaire Dance Studio Hilton Head / Bluffton, competed in a World Promotions ballroom dance competition in Copenhagen, Denmark. Emily was named overall top student in the junior division and Teddy won all his dances in the male amateur junior division. International Junior Golf Academy (IJGA) of Bluffton, SC announces the addition of Justin Perry as chief executive officer of Premier Corporate Professional Services, LLC, an entity which provides a range of services, including legal, accounting, HR and IT support for IJGA, Bishops Gate Golf Academy (BGGA) of Howey-In-The-Hills, Fla. and the Heritage Academy (HA) based on Hilton Head Island, SC. Perry will be directly responsible for legal compliance, insurance, risk management and transactional dealings for these and other related entities and will oversee the accounting, HR, and IT departments. 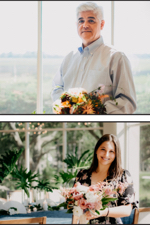 With over 30 years of combined experience in event planning and floral design, Dakotah Terrace and Terry Simmons have launched a new Event Design company, Jardiniére. Headquartered at 61 Arrow Road, Suite. E, Hilton Head Island, Jardiniére’s facility features a consultation showroom, reception, office and studio workroom. The company offers services on Hilton Head Island, in Bluffton, Beaufort, Mt. Pleasant and Charleston areas, as well as the greater Savannah area. 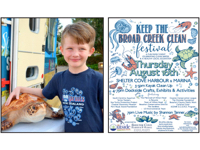 The Outside Foundation is proud to announce the third annual Keep the Broad Creek Clean Festival, which will be held at Shelter Cove Harbour and Marina on Thursday, August 16. The purpose of the event is to educate the community, especially local youth, about the importance of keeping our waterways clean through hands-on activities, exhibits, and entertainment. The festival kicks off with a kayak-based clean-up of the Broad Creek from 3-5 p.m., followed by a variety of dockside crafts and activities on the harbor from 4-7 p.m., and topped off with a live performance by Shannon Tanner at 7 p.m. This year’s event will feature a free raffle, in which attendees can win great prizes including a new kayak from Outside Hilton Head. All events are free and open to all ages. The clean-up portion of the event involves paddling around the banks of the Broad Creek in kayaks and collecting debris and rubbish. Free kayak rentals from Outside Hilton Head are available for the clean-up with reservations, which can be made by calling (843) 686-6996. Please reserve early—space is limited. The Outside Foundation will be providing all cleaning supplies. The Outside Foundation is a local non-profit with a mission to get kids outside and to protect and preserve our local environment. Ongoing projects of the Foundation include trash clean-ups by kayak, donation programs and the Kids in Kayaks program. For more information, visit outsidefoundation.org. 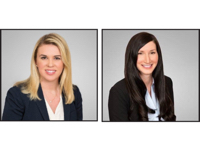 The marketing team at The Sea Pines Resort has been reorganized to better define staff leadership roles, with promotions for Mary Doyle to director of marketing and Shana Banyai to marketing manager. Doyle joined The Sea Pines Resort as marketing manager in 2011, with extensive experience in advertising, media relations and media business. She has lived in the Lowcountry since 2005. Banyai has been on staff at The Sea Pines Resort since 2007, serving in various roles in sales and marketing. The Women’s Association of Hilton Head Island (WAHHI) is pleased to announce their fall luncheon to be held at the Sonesta Resort in Shipyard Plantation, Monday, September 24. 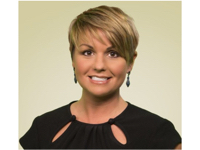 The keynote speaker will be WSAV’s chief meteorologist, Kris Allred. The luncheon is open to WAHHI members and the general public. Founded in 1961, The Women’s Association of Hilton Head Island is an influential group of 750+ women who are active in civic, cultural and philanthropic activities in the Bluffton and Hilton Head Island communities. In May 2018, WAHHI awarded five grants to local non-profits including The Children’s Center, Volunteers in Medicine, Family Promise, Special Olympics South Carolina, and the Children’s Relief Fund. Additionally, WAHHI recognized outstanding community service of five local high school senior with financial awards. The Youth Community Service Awards were presented to: Kalaylah Chisolm, HHI High School; Meredith Inglis, Hilton Head Christian Academy; Elizabeth Rhoads, Bluffton High School; Audre Robinson, Hilton Head Christian Academy; and Madeline Wallin, Bluffton High School. To learn more about WAHHI, visit wahhi.org or for membership information, email Linda Jackson at membership@wahhi.org. 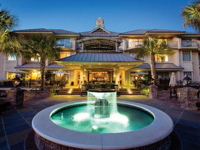 The Inn & Club at Harbour Town has been named among the Top 10 hotels in the South by Travel + Leisure. Additionally, Hilton Head Island was named the No. 1 Island in the U.S. by readers of the prestigious travel magazine. The Sea Pines Resort property has 60 guest rooms fitted with modern furnishings and conveniences, all enhanced by design elements that complement the natural beauty of the South Carolina Lowcountry. Resort guests also have easy access to a full slate of exemplary experiences from stunning beaches, award-winning golf courses (and instruction), and an equestrian center, to pools, tennis, shopping, and the world-famous Harbour Town Yacht Basin.